>This weekend has been rather gloomy, but I’m quite happy that the rain finally has come. I love rainy days! Here’s my Sunday outfit, though not in entirety- I was donning a red and gray plaid Disneyland Pendleton coat while out to church and thrift stores today. 1950s Blouse and quilted skirt- vintage flea market and antique store finds. Kitty- Mister Charles, my indoor kitty investigating the rain while in my arms outside. « >A New to Me 1950s Dress! 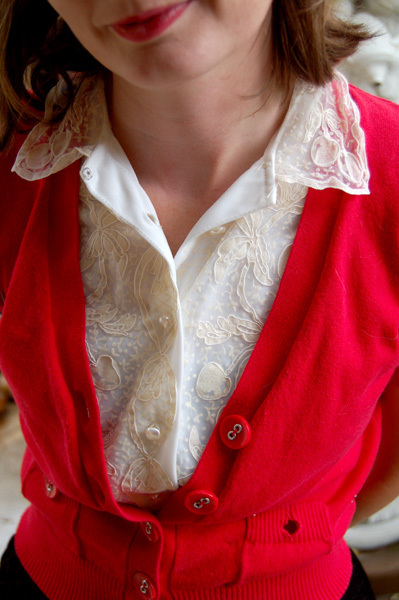 >I love the lace top and the buttons on the sweater! And yay for cats! Can't wait until my hubby and I get a house so we can have pets! >Cute outfit! Funny you mention a Disneyland Pendleton. I bought my first Pendleton a couple of weeks ago and was pleasantly surprised to see the Disneyland label inside. I had no idea they had a store in Frontierland! >thank you for having an indoor kitty ;) ours are indoor kitties only but sometimes i take them out in my arms to enjoy some fresh air (to which they just get a little freaked out and want back inside! )also, you look adorable. I think i need to make myself a quilted skirt for winter. >Hello, Mister CHARLES (is that Nick?). I love all the textures of your outfit…not to mention the colors! Beautiful!! >would love to see a pic of your disneyland pendleton! >I love rainy days, too, but living in Santa Barbara, we get very few!Mr Charles is GORGEOUS! >I'm really hankering after a quilted skirt, very jealous. I have two indoor kitties, there isn't much of a life for an outside kitty in inner London with its plague of pitbulls, foxes and cars. 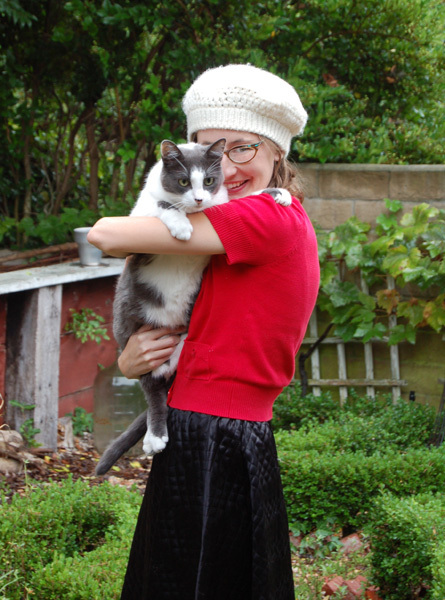 Your cat and outfit are both wonderful.